TRex Indoor RC Helicopter With Cruise Control | OhGizmo! Those tiny indoor RC helicopters have remained popular for a few years now, and while being able to fly one around your living room is what makes them fun, apparently some pilots don’t want to put in the effort. So the TRex, available from Brando for a mere $37.90, includes a hands-free mode. 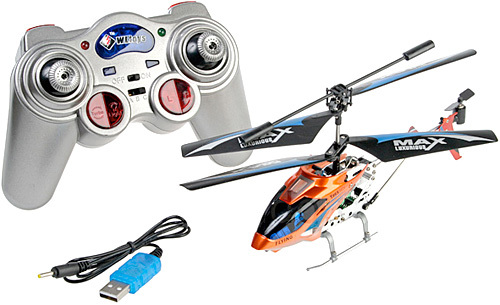 Using the included IR remote you hit a ‘record’ button and then pilot the helicopter through a series of maneuvers. After that the helicopter will replay the same flight over and over without requiring you to do so much as look up from the TV. Fun! Like with any of the miniature RC vehicles on the market the TRex can be charged from the remote, or plugged into a computer’s USB port which should conserve the 6xAAs inside the controller. It also seems to provide more bang for your buck than the choppers you’ll find at most toy stores with a metal housing, full forward, back left and right steering and even a turbo speed mode when you don’t feel like delaying the inevitable collision. Thanks for the awesome find, I'm sure someone in my family will like this as a Christmas gift.